Watch full RWBY Season 5 Episode 4 full HD online. Cartoon video RWBY Episode 56 online for free in HD. 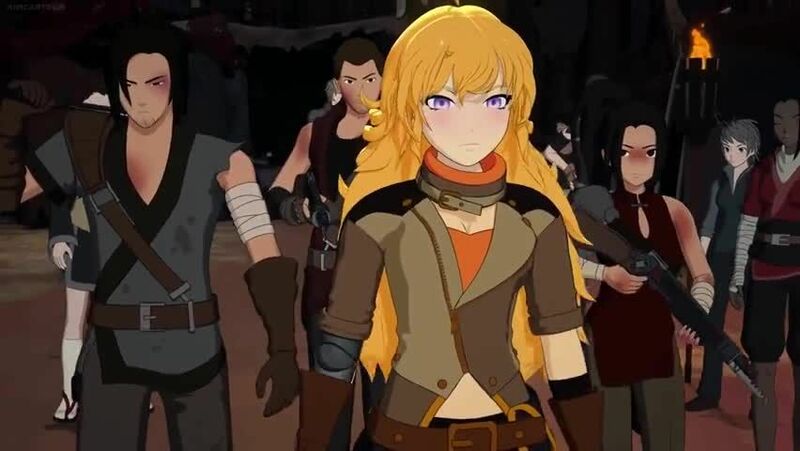 After having a small skirmish with bandits, Yang arrives at Raven’s bandit camp. Yang tells Raven that she needs her Semblance, which allows her to create portals and teleport to people she’s bonded with, in order to get to Ruby. Raven initially refuses, but Weiss escapes her confinement with the help of the Knight and reunites with Yang. Not wanting to attract Grimm, Raven agrees to Yang’s demands and begins to tell them the truth about Ozpin. Meanwhile, in Mistral, Ozpin helps Team RNJR and Oscar train. As Jaune has yet to unlock his Semblance, they all offer to help him.